Wednesday, March 6, 2013 at 3:54PM Mrs. G.
1) Where was the last place you went on vacation? 2) What is your favorite pizza topping? 3) Did you have a favorite stuffed animal when you were a kid? If so, what was it? 4) Do you speak any other languages? 5) What is one of the best pieces of advice you have ever received? Wednesday, February 27, 2013 at 5:48PM Mrs. G.
1) What is one of the top ten embarrassing moments of your life so far? 2) Pancakes or waffles? Sausage or bacon? 3) What habit would you like to break? 4) Is it more fun to be a parent or a child? 5) What's the last movie you saw that made you belly laugh? Wednesday 6...No Reason, No Motive. Just Curious. Wednesday, February 20, 2013 at 1:27PM Mrs. G.
1) What alcohol/cocktail can you never drink again? Why? 2) Have you ever seen someone perform an unexpected act of heroism? What was it? 3) What would your child be likely to say to their therapist about you? 4) If you found $200 at an ATM machine would you return it to the bank? 5) Are you a hugger? 6) If cost were no object, who would you like to perform at your next birthday bash? Wednesday 8...No Reason, No Motive. Just Curious. Wednesday, January 30, 2013 at 2:45PM Mrs. G.
1) Do you think family should stick together no matter what, because, you know, family is family? 2) What fad did you partake in that is slightly embarrassing now? 3) If you had to wallpaper your bedroom wall with someone's face, whose face would you choose? 4) If you were to write an autobiography, what would you call it? 5) If money and availability were no object, what artist would you like to own a painting by? 6) What's your favorite veggie? 7) Buried or cremated? If cremated, do you want your ashes scattered someplace special? 8) What celebrity reminds you of your mother? 3) If you had to wallpaper your bedroom wall with someone's face, whose face would you choice. 7) Buried or cremated? Do you want your ashes scattered someplace special? Wednesday, January 23, 2013 at 2:56PM Mrs. G.
1) Did you watch the inauguration? 2) What do you think of Michelle Obama's new bangs? 3) How do you feel about the First Lady's inauguration ball gown? 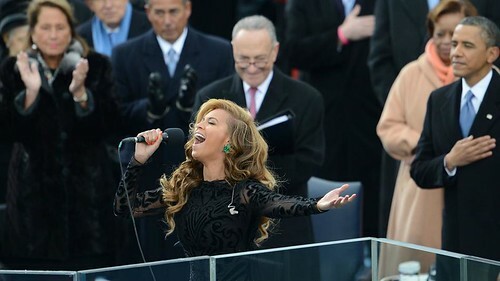 4) Does it bother you Beyonce lip synched the national anthem? 5) Are these girls not turning into stunning young women? Bonus Canine Question: Mrs. G's dogs, Chewie and Gus, have an insatiable appetite for paper towels, which they shred into tiny bits all over the house. What does your dog jones for? Wednesday 1...No Reason, No Motive. Just Curious. Wednesday, December 19, 2012 at 8:53AM Mrs. G.
Photo courtesy of the Flickr Commons, no copyright. Tuesday, October 16, 2012 at 9:25PM Mrs. G.
1) Where do you wish you could wake up tomorrow? 3) What is one of your favorite lines of a song? 5) What do you do if you don't like the person your child has chosen to date or marry? 6) What is a story in your family that is told again and again? 7) If you were going to die at midnight, what would you be doing at 11:45? 8) Have you ever been on a date so awkward/horrible you made an excuse to leave?